Zulekha Hospital says its ongoing breast cancer awareness drive is having a growing impact after a record number of female patients registered for X-Ray mammograms and specialist check-ups. A total of 2,902 women have attended medical appointments at Zulekha Hospitals in Sharjah and Dubai since the launch of the ‘Pink It Now’ initiative in October 2016. This represents a 58% increase in consultations from its 2015 campaign. 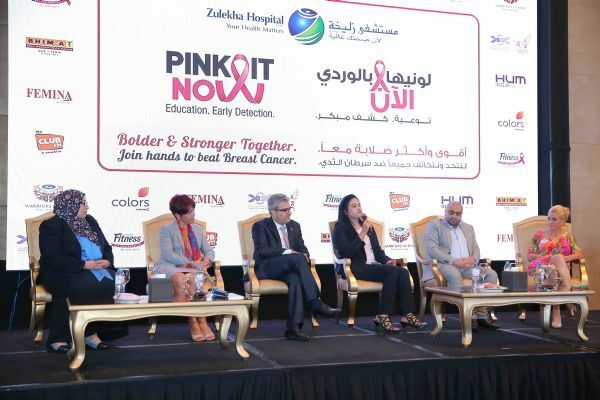 Launched by Her Excellency Sheikha Lubna bint Khalid bin Sultan Al Qasimi, Founding Board Member of Friends for Cancer Patients (FoCP), ‘Pink It Now’ was the latest part of Zulekha Hospitals’ string of CSR initiatives aimed at raising health awareness in the UAE. According to a WHO World Cancer Report, breast cancer has a substantially higher incidence than any other type of carcinoma. In 2012 alone the UAE registered 568 incidences of the disease, a rate five times higher than those of cervical or colorectal cancer and currently the disease amounts to 30% of all cancer cases across the MENA region. “The numbers clearly show that our messages about the importance of the disease detection and treatment options prompt women into action,” said Dr Pamela Munster, renowned cancer expert from the University of California in San Francisco (UCSF), United States, and the campaign’s long-standing ambassador. The initiative, which concluded last week (Saturday, 31 December), comes in line with the UAE government’s health goal of decreasing cancer fatalities within 2021, and is being undertaken in collaboration with The Pink Caravan, a FoCP initiative that has been functioning in the UAE since 2011 to raise awareness about breast cancer; highlighting the importance of early detection, regular check-ups, and dispelling the innumerable myths that surround the disease. Zanubia Shams, Zulekha Hospital Co-chairperson and the campaign’s creator, said: “We are overwhelmed by the response to ‘Pink It Now’ as the number of women registering for appointments grew by 58 per cent since last year while the number of positive cases detected remained at 13. ‘Pink It Now,’ supported by partners including Friends of Cancer Patients, Pink Caravan, Ford Warriors in Pink – Ford MENA, Nestle Fitness, Bhima Jewellers, Colors TV, radio channels HUM FM and CLUB FM, and Femina ME, is one of Zulekha Hospital’s core CSR initiatives, stressing the importance of strategies for cancer prevention, early detection and management of patients with the disease. The campaign will return to Dubai and Sharjah in October 2017.